There are loads of ways to check your stats on OSM. We are currently re-designing the dashboards to assist all of our mappers in seeing how they contributed. We have always been aware how important measurement is. Peter Drucker, a world famous organisational motivational analyst and writer says: that which gets measured gets done. And of course he is right. Right now MafomeB has supplied us with a “YESTERDAY” dashboard that looks at the last 24 hours of mapping. It updates on an hourly basis, dropping off the data that is older than 24 hours. It is a good indication of who is active and whether they are mapping light or heavy. Also really super useful is the OSM stats service provided by Pascal Neis. When we point it at Lesotho it shows all the above, in a different way. In addition it shows the breakdown or CREATE, MODIFY and DELETE instances, which again is something that helps us to understand what is going on. 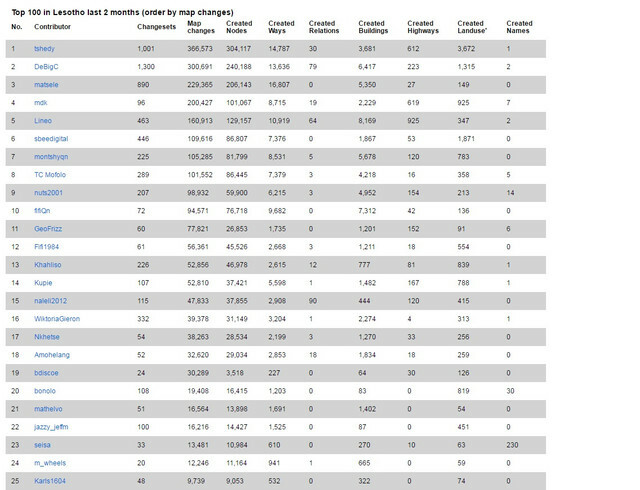 Down towards the bottom is a nice table, and this shows the aggregation of the last 2 months of mapping, again this shifts along to the appropriate point two months ago. Again, with a little more raw of a feel is the OSM database page. Forgive the GPS stats when it opens, and if you scroll down a little you get to see an awesome table of “top contributors of the day, week and month”. There is a high frequency of times that Lesotho mappers have been high on that list. A real personal favourite of mine is another of Pascal Neis’ creations, cleverly dubbed “How did you contribute?” This requires you to enter your OSM username. You can then glean a whole lot of information about yourself and be really vain like I just was a second ago. On mine it says that I’ve mapped 23 countries, and am over the 2.5 million mark and now the 310th mapper in the world for node count ;).